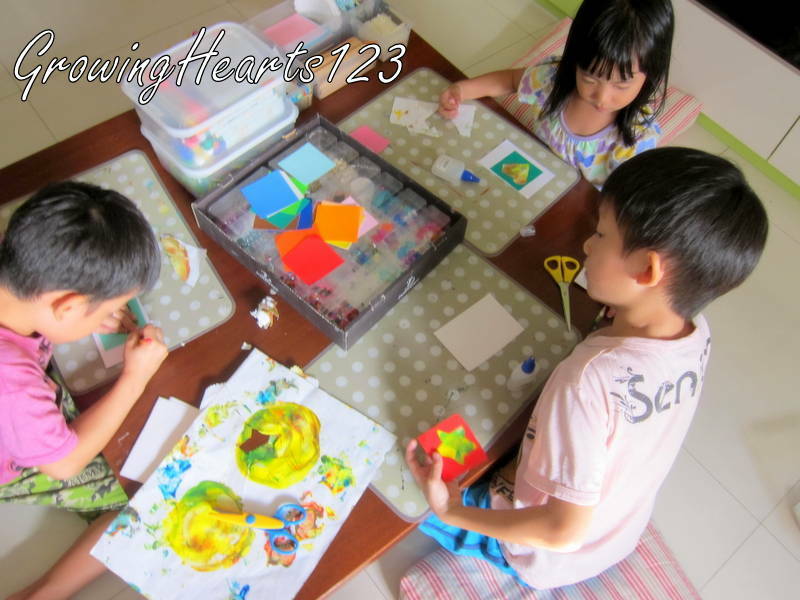 For this Teacher’s Day, kiddos had used their handmade magnets which were made some time back as gifts. 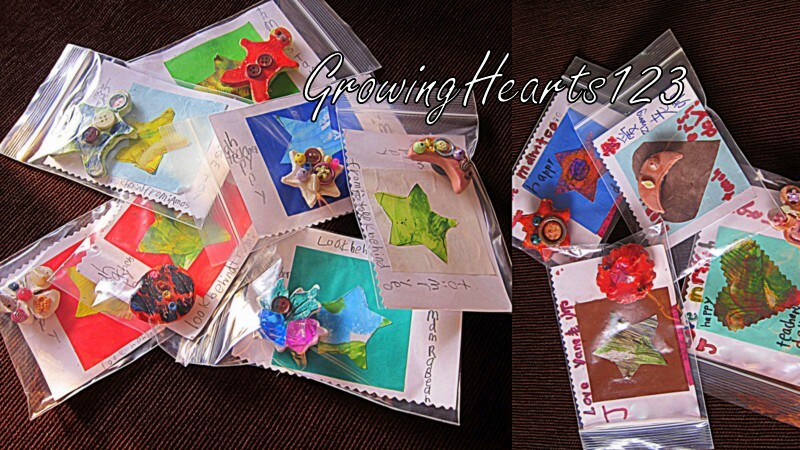 The magnets had been made in advance so that they can pick and choose their creations to be used for future gifts. 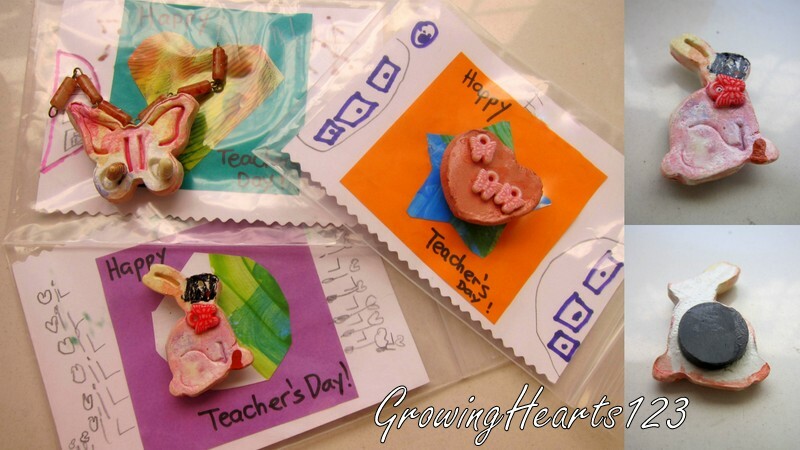 Last year we also did something similar for Teacher’s Day but this time we focused fully on magnets. 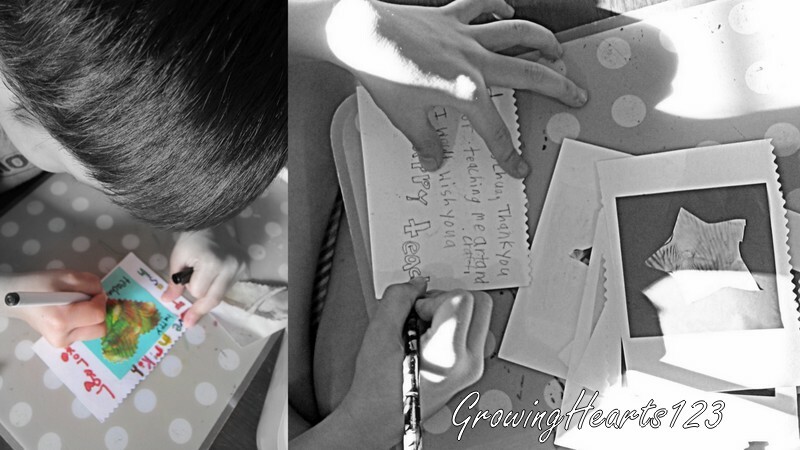 This made me realise that when it comes to creating gifts, it is good to make them way in advance so that we need not rush to do something last minute? Of course, there’s the question on ‘sincerity’ of the gifts being not made ‘specially’ for that person in mind. 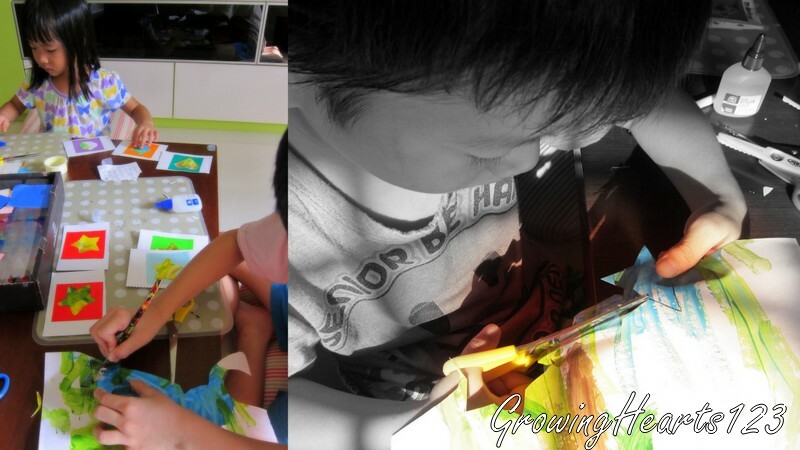 However, in art creation, I view the workmanship and creation from these lil hands as precious and to be treasured. It is afterall, the thought and in our case, the effort that counts to show appreciation through their works of art. I recall how my kids had scrambled to ‘prepare’ gifts for me on my birthday. They drew and painted cards for me. Then J had wrapped his own torchlight for me. It was what I had bought for him and I asked him why he did that. He said it’s for me to play in the dark! lol. I chuckled and told him it’s for him and offered an alternative. Since he has a heart to give me something, why not give something from his treasure box or what he had made before? E heard it and secretly wrapped her sticker craft and Hama bead craft as gifts. J gave me his Hama bead craft and one of his pen. A gave me his handmade lamb which he made in his Chinese class. Practically speaking, the kids will do what they do with or without the specific person in mind, as these are creations from within. I realise that because of the process of making gifts, they offer their gifts with much pride and joy to the respective family member/friends/elders in this case, Teachers. Plus, they are One-Of-A-Kind. No two magnets are the same. J’s own words of gratitude. I am impressed that just one year ago, they had difficulty spelling and writing. This time round, the boys had thought of what to write for their teachers and were independently making their own cards. I am grateful to these teachers who have such great and positive influence as reflected by such hearty handwritten cards from my kids! Truly, we are blessed to have such passionate and caring teachers! 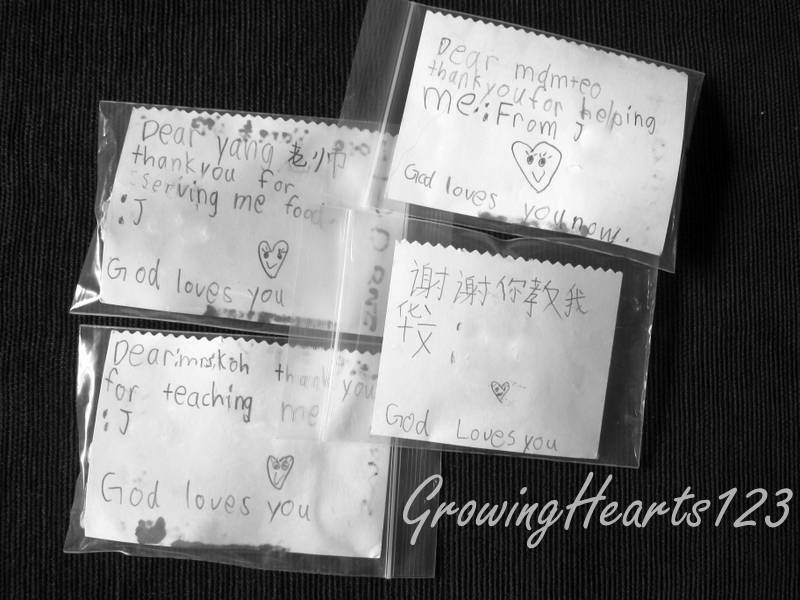 Do you have a teacher to thank? Previous HeARTY Slam Dunk Lessons 4 : Wacky Artist!